Frame rate is capped at 30 FPS by default. See High frame rate. GOG.com and Steam versions are already patched. Patch 1.01 (German) updates the game to the latest version. Delete or rename logo_collective.bik, logo_legal.bik, and logo_lucas.bik. Always enabled, to turn it off see Vsync. Click on Edit, then Add. Set Do not notify on task switch. Set the window position and size. Set Desktop for borderless fullscreen windowed. Click OK, then File and Save. Open default.cfg with a text editor. Open vars.cfg with a text editor. Changing FPS may cause bugs with animation and desynced audio in cutscenes. Uncapping FPS may render game unbeatable. Set the following lines to these values. 1. Fan translation by «ENPY Studio/Spirit Team». 2. Unofficial translation by «Творческая группа Дядюшка Рисёч/Fargus». and review. Not available on GOG.com and Steam, download. Download Movies/Loading screens fix (Full Screen 1280x960). 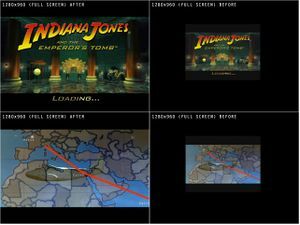 Copy movies folder from archive to <path-to-game>\GameData\indy\ and overwrite. Works only on 1280x960 in-game resolution (check on OPTIONS>DISPLAY). Requires FULL K-Lite codecs pack (K-Lite Codec Pack Full). FMVs may not be displayed properly. 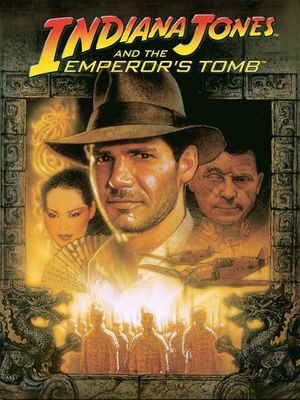 Go to Indiana Jones® and the Emperor's Tomb™ > Guides > Various engine options. Download Debug Patch to enable hidden DebugUI and Debug windows. ↑ 2.0 2.1 File/folder structure within this directory reflects the path(s) listed for Windows and/or Steam game data (use Wine regedit to access Windows registry paths). Games with Steam Cloud support may store data in ~/.steam/steam/userdata/<user-id>/560430/ in addition to or instead of this directory. The app ID (560430) may differ in some cases. Treat backslashes as forward slashes. See the glossary page for details. This page was last edited on 14 April 2019, at 03:20.